Have the terrier breeds of Scotland lost their sporting heritage? The West Highland is a show ring favourite; the Cairn has a loyal following, with, I understand, at least one working terrier backer; the Skye could be lost to us within half a century. The Scottie is still with us but like the others has no discernible working activity. The Dandie Dinmont has, I believe, a tiny band of working devotees. Do any of them deserve to retain their sporting terrier tag? Working use apart, do these breeds still retain the anatomy to work? I despair when I hear a show breeder of these worthy and long-established breeds declare that he “doesn’t want his terriers to go to ground, so why get het-up about the ability to do so”. So much for respecting the origins of your breed! For centuries, Scotland has had small rough-haired terriers,reference being made as far back as 1436 by John Leslie, in his ‘History of Scotland’, to a ‘dog of low height, which, creeping into subterraneous burrows, routs out the foxes, badgers, martens, and wild cats from their lurking places and dens.’ HD Richardson, writing in 1853, refers to three varieties of Scottish terriers, one ‘sandy-red and rather high on the legs’ and called the Highland Terrier; a second, the same size but ‘with the hair somewhat flowing and much longer, which gives a short appearance to the legs. This is the prevailing breed of the Western Isles of Scotland’; and a third ‘the dog celebrated by Sir Walter Scott as the Pepper and Mustard or Dandie Dinmont breed’. From this account, you could be forgiven for thinking of the Cairn, the Scottie and the Westie as one breed, with the Skye and the Dandie also featuring as distinct breeds at that time. 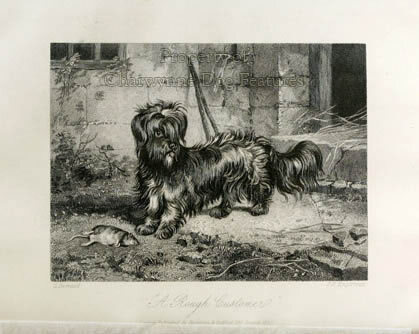 Colonel Hamilton Smith, writing in Volume X of the ‘Naturalists’Library’, published in 1840, considered the Scottish Terrier to be the oldest representative of what he termed the cur dog race in Great Britain, stating: ‘Our diminutive modern terrier, particularly the Scottish or rough-haired breed, is therefore the race we look upon as the most ancient dog of Britain…and in no part of Europe has the rough-haired breed retained so completely as in Britain all the traits which constitutes a typical species. No dog carries the head so high…’ Despite the Colonel’s scholarly researches, I am forever suspicious of Victorian writers on terriers, the latter were utilised by working men, unlike gundogs and hounds; whole libraries have been written about the latter, not many books were devoted to terriers in previous centuries and not every distinguished writer of those times was familiar with terrier work, terrier-breeding and terrier construction. Two authors, sixty years apart, but both writing on sporting terriers, Pierce O’Conor and Brian Plummer, didn’t write gushingly about terriers from Scotland. On the Dandie, O’Conor wrote “They are now, I fear, little used for work, ‘at the tods and the brocks’, more’s the pity. The show bench Dandie is rather too heavy and too low to the ground for an active working dog.” Plummer wrote of the Dandie “It is in fact a pity that nobody is prepared to exploit the working qualities of the Dandie Dinmont for the type is still ideal for working below ground.” On the Scottish Terrier, O’Conor wrote: “Today, he is ‘a thing of beauty and a joy for ever’ no doubt, but alas! 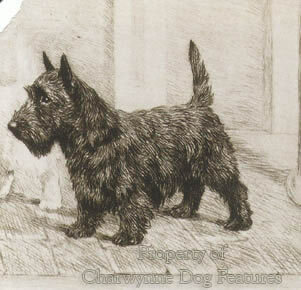 a poor workman.” Plummer wrote of this breed: “As to when the Scottish Terrier was last worked is yet another moot point.” He quoted Lucas who noted the inability of the breed to work as a pack. But the Cairn Terrier is being worked by at least one enthusiast, using stock from the Cam Cairn kennels. He found they packed well above ground when used as a family or with kennel mates, praising their work in heavy cover and their scenting ability when bushing. Not surprisingly, Scottish keepers used the bigger leggier terriers on the moors and smaller shorter ones for going to ground. Much is made by show breeders of size, shoulder height becoming more important than hunting instincts. An experienced Highland keeper wrote in a 1914 issue of Dog Weekly: “Give me a medium-length back Cairn, strong hindquarters, good feet and not too short-legged.” In the 1930s Madame de Parseval of Charmont, Senlis (Ouse) in France was hunting otters with her pedigree Cairns, one a show champion. 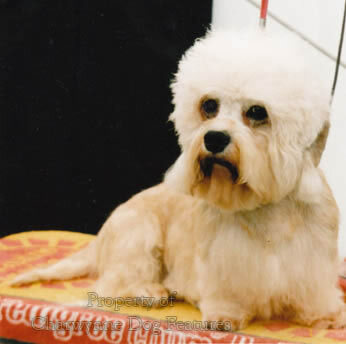 Terrierman Alf Rhodes of Darton near Barnsley, who died in 2003, was using a Dandie called ‘Cindy’ (born 1973) right up to her eighth birthday; he worked several terrier breeds but swore by her. Yet in the early 1920s Gavin Haddon’s renowned earthdog and grandson of the famous Yellow Dirk, perpetuating EB Smith’s legendary Blackett House strain, was considered to be the last of the working Dandies. 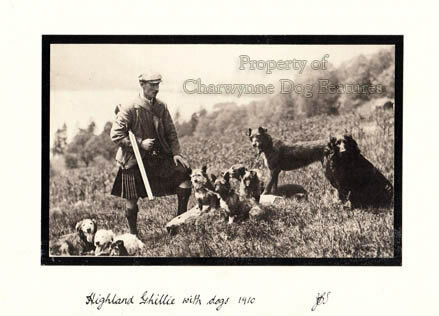 A gamekeeper called Archie Dalrymple was using Skyes in pairs against vermin and otter in the late 1940s, favouring a 9” dog, much shorter than the 40” nose to tail dogs of today. Were these the last workers in these breeds? In his book on hunt teriers, Lucas wrote “It must not be assumed that the bench has ruined everything. That pluck still exists in the right type of Highland terriers.” He may well be right but pluck without the backing of the appropriate terrier physique is not by itself going to make a worker. The excessive coats, elongated spines and weak back-ends of the show Skyes, the under-muscled Westies and open-coated Cairns, along with heavily-coated Scotties and their overdone heads, don’t offer much of an enticement to sporting terriermen. Any enthusiast wishing to try the terriers of Scotland as workers would need to exercise great caution before choosing pedigree stock. Show ring judges in their post-show critiques in recent years have commented on pinning-in at the front and movement too close behind in Cairns, weak muzzles, poor front and hind movement, woolly coats and thin feet in Dandies, out at elbow, narrow and poor fronts in Scotties, ‘Queen Anne’ fronts and weak hind movement in Skyes, poor rear construction, straight stifles and upright shoulders in Westies, and with one Crufts judge stating that the Cairns at the world’s premier shows were ‘not of sufficient quality to be called show dogs’! Terrier authority John Winch, writing in the Fell and Moorland Working Terrier Club magazine, once described the Dandie Dinmont as the ‘crème-de-la-crème’ of working terriers, yet a couple of decades later they are only patronized in the show ring. Does the effeminate-sounding breed title, coming as it does from a fictional sporting squire in one of Scott’s novels, put down-to-earth terriermen off? 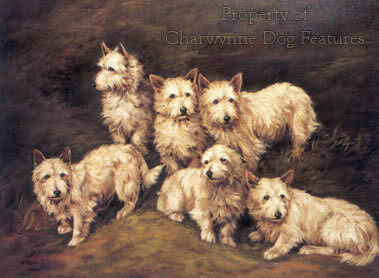 The Cairn Terrier got its name from a 1907 show ring judge’s objection to the title ‘short-haired Skyes’; they were not called Cairn Terriers in Scotland before that. Rather than Westies and Scotties we so easily could have had Aberdeen, Pitterween, Poltalloch and Roseneath Terrier breeds, rather as we have Fell, Patterdale, Plummer and Lucas terriers now. Will some latter-day Scottish Brian Plummer come up with a revised working terrier from Scotland, perhaps in that stunning deep red chestnut coat which once featured in Cairns, lacking the overcoats of the Scotties, the centipedal structure of the Skye and the rather poncey topknot of the Dandie! It can be done; there are probably now more Plummer Terriers than Fox Terriers and more Sporting Lucas Terriers than Skye Terriers. What a project for a patriotic Scottish terrier enthusiast and what a rich heritage to call on.